The reviewer received an advanced reader's copy of the book from the publisher. I've been a fan of Louise Borden since I read The Journey That Saved Curious George which chronicles the real-life escape of Margaret and H.A. Rey (authors of Curious George) from Nazis during World War II. Borden is also known for the historical fiction picture book, The Great Skating Race: A World War II Story from the Netherlands. 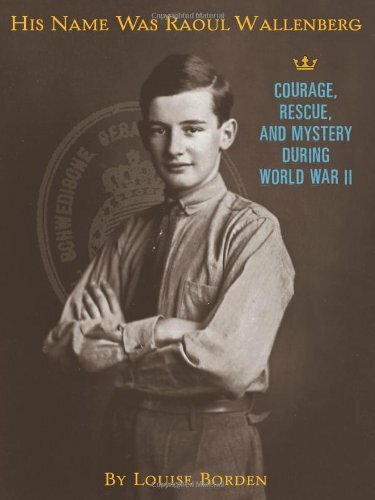 In her latest book, Borden introduces readers to Raoul Wallenberg, a real life hero who saved thousands of Jews in Hungary during World War II. Wallenberg was born into a wealthy family in Sweden in 1912. He proved to be an excellent student and used his family's wealth and status to travel the world. After earning an architecture degree in the United States, Wallenberg returned to his homeland of Sweden. Wallenberg was a strong communicator and spoke several languages, and he was sent to Budapest as a diplomat in 1944. He was charged with the responsibility of protecting Jews living in Hungary. Wallenberg set up an office and hired hundreds of employees to print "schutz passes" or protection passports that placed Jews under the protection of the Swedish government. Wallenberg also invented the collective passport which allowed more than one person to share a passport. Wallenberg's work didn't stop with passports; he purchased and rented apartment buildings that served as safe houses for Jews in Budapest. Unfortunately, Wallenberg was detained in a Soviet prison in 1945; he was never seen again. The format of the book works well for the subject. The text's poetic form is effective with concise writing, short lines and wide margins. Numerous photographs and primary documents (passports, letters and drawing by Wallenberg) bring the story to life and will engage readers and show how one person can make a difference in the world. Borden traveled to Sweden and Switzerland to interview Wallenberg's sister and brother. This background work helps Borden paint a portrait of a strong and resourceful young man who had saved thousands of lives. An extensive bibliography along with recent photographs of Wallenberg's family can be found in the back of the book. History buffs and students studying the Holocaust shouldn't miss this powerful story. I just read a review of this one today - sounds great! And hey, I just have to say - I'm pretty oblivious to this kind of thing normally, but it looks like you prettied the blog up a bit. And it looks great!